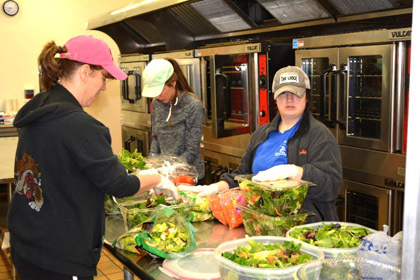 From left, Lynn Fanning, Ashlee Matthews and Kara Bratcher prep bowls upon bowls of salad in preparation for Altrusa International of Artesia’s annual smorgasbord last year. The group will host its 54th Annual Smorgasbord from 11 a.m. – 1:30 p.m. Sunday, Feb. 12, in the Park Junior High School cafeteria. Tickets are $12 for adults, $6 for children 12 and under, and may be purchased from any Altrusa member, at Brown Drug, or by emailing [email protected] Dine-in and carry-out options are available. Proceeds will benefit the many local charitable organizations aided by the Altrusa Club.